A stew is made when vegetables and meat are cooked at a low temperature or it can also be said that in a stew there is a combination of solid contents which are cooked on a low temperature in liquid contents that results in a gravy like textures. Stews are very much alike soups, but usually soups have more liquid while stews are thicker in consistency and cooked for a longer period of time, the serving of stews might also be done differently than soups, s soups are always served in the bowl stews can be served on a plate where the gravy can be poured all over the solid contents. For stewing less tender pieces of meat are more appropriate as they are cooked on low heat and becomes juicy and tender. Stew is a tasty and healthy meal, it is enriched with a lot of nutrients which are very beneficial for the body, it can also be included if you are planning your diet to lose weight, cabbage stew will be very helpful and beneficial in this regard. Chicken stew which is incorporated with turmeric and apple cider vinegar is also very helpful in losing fats and detoxifying the body. Being physically active while being on a keto diet is very important for health and fitness. Initially it might be a little bit hard since the body takes some time to get used to it so you should take it easy in the start. Once you start gaining the energy physical activities like lifting, running, training will further boost the energy level. You can make proper meal plans according to the physical workouts. Does it sound too good to be true? Let’s get to facts and prove the benefits to you. Just Click "Buy with 1-Click" and start your new happy and healthy life today! 5.0 out of 5 starsWorth adding to your Keto cookbook arsenal! Wow! 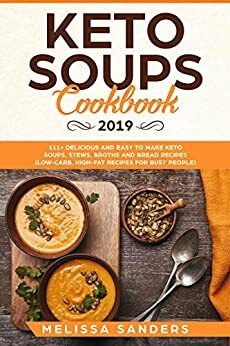 As a picky eater I don’t always have the best of luck with cookbooks, but Carolyn has packed Keto Soups and Stews with so many delicious recipes I’ve had no trouble finding things I want to make! After almost two years of doing Keto it’s great to find resources like this to add some variety into my daily meals. The pictures are beautiful and the instructions are well written. I also appreciated the recipe classifications- as someone who does a lot of meal prep knowing ahead of time if a dish will reheat and/or freeze well is super important. I’ve been recommending this cookbook to as many people as I can! Whether you’re new to keto or have been doing it for years this book is an absolute gem. This book is written all about success.Vegetables and meat are cooked at a low temperature or it can also be said that in a stew there is a combination of solid contents which are cooked on a low temperature in liquid contents that results in a gravy like textures. Stews are very much alike soups, but usually soups have more liquid while stews are thicker in consistency and cooked for a longer period of time, the serving of stews might also be done differently than soups, s soups are always served in the bowl stews can be served on a plate where the gravy can be poured all over the solid contents. For stewing less tender pieces of meat are more appropriate as they are cooked on low heat and becomes juicy and tender. The formulas are incredible and utilize promptly accessible fixings. Many are likewise vegan in case you're searching for that. The main downside is that a significant number of the formulas are for a slow cooker for under 8 hours. Since I work throughout the day, the 4 hours or fewer formulas must be made amid the end of the week, however, some can most likely be adjusted to longer utilizing low rather than high. I am in keto diet now, just for organism cleaning and like this cookbook as it has various recipes to try out. Keto diet is very popular for now and many of my friends are following this diet and have already got some good results, so I hope to reach the top of my wishes and loose more than my friends. Hope this book will help me to do that . I like this book for people learning Keto Soups Cookbook. Very good explanations Stews, Broths and Bread Recipes For Beginners. if you really want to know about the 111+ Delicious ! Recommended for any reader who want to reading. I'm looking forward to the Most Actionable! Highly recommended for all.